After our visit to The Plant Provocateur we set off for the UCLA campus and the Fowler Museum. The Fowler was having an exhibition, Disguise: Masks & Global African Art, that Andrew wanted to see. It was a good one, and the museum has free admission, gotta love that. This is the courtyard at the Fowler. Since I tend to move through art museums faster than he does it was nice to be able to step outside and get some fresh air and sunshine. Finished at the Fowler we walked back across campus to something we'd spotted on the way in. Oh ya!...who knew? There's a botanical garden at UCLA! The Mildred E. Mathias Botanical Garden is a "living museum, having special collections designed to assist the undergraduate teaching mission at UCLA and to augment the capability for research on campus. MEMBG serves as a long-term repository for unusual plants, a refugium for biodiversity. This facility offers its educational content to the campus community, residents of Los Angeles, and visitors from around the world to enhance learning about plants and promote greater appreciation for relevance of plants to society." Mildred herself sounds like quite the force, read about her here. I wonder why you never see Eucalyptus blooms sold as cut flowers? Perhaps they don't last? They're certainly beautiful. December in Los Angeles, what an experience. One would I gladly give up snow and Christmas trees for. That street below is the one we'd traveled earlier, when we spotted the garden. Admission into the garden was also free. I am impressed UCLA! Over on the garden's website there's a list of campus plants, ones found on the "400 acre UCLA campus outside the Mildred E. Mathias Botanical Garden." And lest you forget you're in L.A. there's a view of the buildings on Wilshire Boulevard, just a few blocks away (at least I think that's what we're looking at!). Yep, before hopping on his cute get-away-cart this fellow told Andrew to leave "this area is not open to the public" and then locked the gate behind him. What's eating the small cactus? Enlarged, for your viewing pleasure. This (Callistemon? 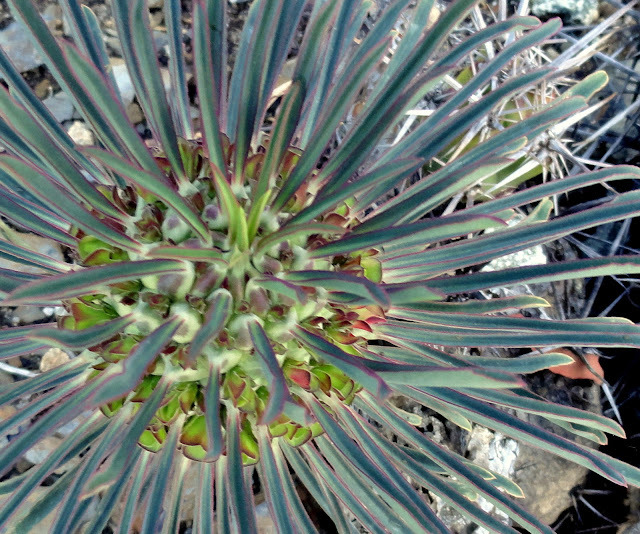 Dunno) Calothamnus (thanks Evan) doesn't even have to bloom to be colorful. We wandered back through the rest of the garden, which we sadly weren't able to spend much time in, on our way out. Doryanthes excelsa, Globe Spear Lily. They look a little ragged here, but in person they were fabulous. What a wonderful, unexpected treat to have discovered this garden. I knew! I lived there, there on that road in a dorm called Hershey Hall now an ad building. My room with a balcony was on the corner next to the garden. Mildred Matthias was my botany teacher and the garden was my playground. A fortunate girl, wasn't I? Really!? Yes, you were a fortunate girl. What a great story!!! Hidden garden treasures are the best finds. It's an amazing find for a college campus which are usually fairly stark with a few struggling shrubs. Right? The whole campus was beautiful, quite a feat with the lack of rain they've endured. Beautiful place! What a happy surprise! I wouldn't be shocked if it were rabbits that are eating the cacti. Our new ones get nibbled by our local bunnies. They don't eat much, but the nibbled ones are more prone to bad stuff. I'll have to look for those little cages. Ah, I bet you're right. Darn Wascally Wabbits! I'm soaking up the blue skies in so many of your photos. Of course we did have one day like that recently, so I've not completely forgotten what the real thing is like. I sure do enjoy your vacations. I was thinking about how much I enjoy reliving our vacations via posting about them. I get to experience it all twice, pretty wonderful. Both the museum and botanical garden look very interesting. So cool that the cost of admission is everyone's favorite price! While December in L.A. looks amazing, I might wax nostalgic for cold and evergreens if living there. Andrew and I were talking about this very thing the other night. Would we miss the seasons and the signals that we've been tuned into our entire lives? I want to find out! I'd like a chance to find out too! Missed this when we were on the campus years ago. But I remember taking pix of amazing trees. It is a beautiful spot, I wish we would have had more time to explore. Thank you again for bring another beautiful garden to my attention. I must have driven by UCLA hundreds of times and never went in to explore. It is a great collection and the exhibit looked fascinating. A stop for your next LA trip perhaps? Yep, there's definitely something to be said for Southern California in the winter. It would be even dreamier without 1/2 of the people and 3/4 of the traffic :-). Yes those things certainly do tamper the experience. Fascinating. I wish I could be in that botanical garden today. The Invisible Man mask is interesting. Everyone in snowy, wintry climates should get to escape for a long weekend in SoCal! I did a lot of plant ID classwork in that garden, so very fond memories. Have to get back more regularly! Ah, a part of your past that I was not aware of! I think you've seen more of current-day LA than I have! Both my husband and I attended grad school at UCLA but I've only been back there a half-dozen times since that I recall, all in circumstances that didn't permit side trips. I do have fond memories of that botanical garden, though. Ha! Might be true Kris. "oh deer"...that was a good one Evan. Thank you for solving the mystery! Yes! It did seem familiar and there were little seed pods reminiscent of a Callistemon, which is why I made that leap. I see in Max's comment he points out: "More closely related to bottlebrush, and often called 'One-sided bottlebrush'..." Thanks Evan! What beautiful gardens. And what a meanie that guy on the cart was, haha. I think you're right about the reason you don't see Eucalyptus flowers in arrangements - from memory they dry up really quickly. He seemed to be a no-humor sort of fellow. Probably has to kick people out all the time. Thanks for the (sad) Eucalyptus flower confirmation. We have distinct seasons here, we do. Just need to know what to look for or perhaps better to say feel for--the seasons here are best discerned with the skin, not the eyes. I imagine the guy on the cart sees vandalism and thievery on a regular basis, unfortunately. The yucca to his left and the Dracaena on his right as he rolled away--oh, my! They look as old as California. How wonderful! I'll need to add this garden to my list of places to visit. You're showing me more great places to visit so close to home! Thanks for sharing your vacations. Wonderful. If we get to LA again, we'll have to see this garden.